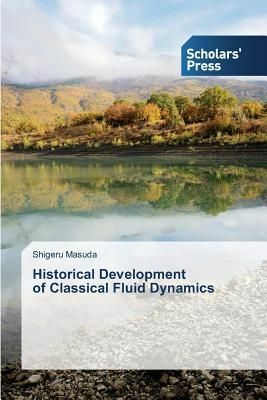 We discuss the historical development of classical fluid dynamics consisting with four parts. Part 1: Exact differential as the criteria of equilibrium/motion and irrotational motion/rotary motion; Part 2: The "two-constant" theory and tensor function underlying the Navier-Stokes equations; Part 3: The Microscopically-descriptive hydrodynamical equations in the gas theory; Part 4: The early studies of solutions of Navier-Stokes equations. Owing to the arrival of continuum theory, many mathematical developments are brought in today's fluid mechanics, such as the Euler equations, the Navier-Stokes equations, the Stokes equations, the Helmholtz vorticity equations, Boltzmann's transport equations. We introduce the thinking methods and modeling of these equations, including capillarity theories of fluid particles in continuum by Laplace, Gauss and Poisson, with the classical notation and styles, the disputing contents of their themes discussed among progenitors. Microscopically-descriptive expressions are succeeded into Boltzmann's equations, and contribute to the quantum mechanics such as Schrodinger equations. Now, this is hitting by peerers on Tokyo Metro. Univ. Repository.